Shipping a car is our specialty = We currently ship an average of 1500 cars every month from all over the United States and Canada to the rest of the world. In addition, we ship hundreds of motorcycles, boats, RVs and other vehicles of any kind. See why companies like Tesla Motors rely on CFR Rinkens for safe & reliable vehicle shipping. 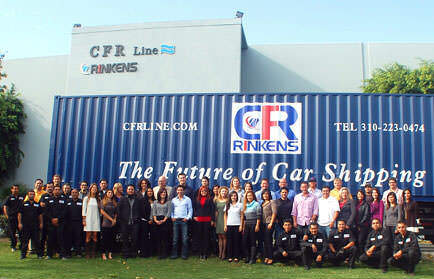 CFR Rinkens prides itself in having its own domestic trucking department that can pick up any vehicles from anywhere in the United States, usually within just a few days. Shipping a car from your location is easy; all we need is the address and contact information where the vehicle needs to be picked up = and our team gets right on the job. We can ship cars from your location to the port in an open carrier truck, or in an enclosed transporter. Once the vehicle arrives at one of our port terminals, we prepare the overseas shipping. Our expert shipping agents are ready to assist you every step of the way.